Hot materials: G682(golden sand, sunset gold, gold peach), Tiger skin yellow, G654, Shanxi Black, Black Galaxy, Baltic Brown, Blue Pearl, Emerald Pearl, Verde Ubatuba, Tropic Brown, Giallo, Venezianot, Giallo Cecillia, Santa Cecilia, Giallo Ornamental etc. Bevel, Full Bull-nose, Half Bull-nose, OG, Laminated Bevel, Laminated Full Bull-nose, Laminated OG, etc. During the whole production process, from material choosing, fabrication to package, our quality auditors will strictly control each single and every process to ensure quality standards and punctual delivery. 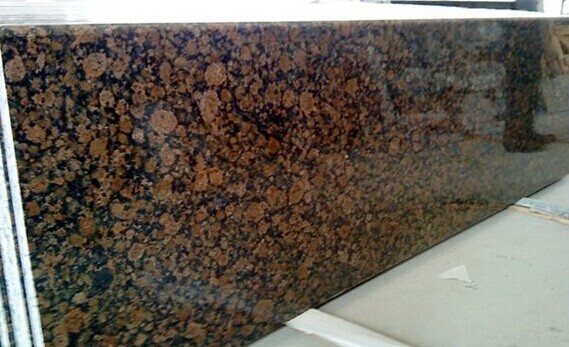 Hot Sale Baltic Brown Granite Kitchen Countertops is famous in America, Europe and Australia etc According to your demands or drawing. It's absolutely a top option for kitchentop. 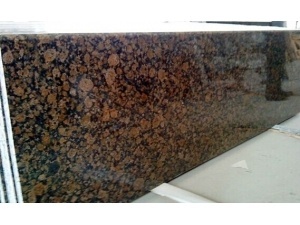 we could process and make different sizes and models of granite counter top and vanity top to meet your requirement.Baltic Brown Granite is the best option to the kitchen design.